World War II veteran Bob MacDonald (Fred MacMurray) surprises his new wife, Betty (Claudette Colbert), by quitting his city job and moving them to a dilapidated farm in the country. While Betty gamely struggles with managing the crumbling house and holding off nosy neighbors and a recalcitrant pig, Bob makes plans for crops and livestock. The couple's bliss is shaken by a visit from a beautiful farm owner (Louise Allbritton), who seems to want more from Bob than just managing her property. 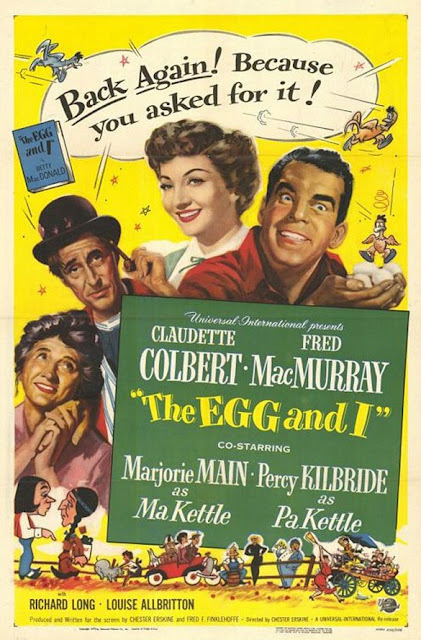 Featuring Marjorie Main and Percy Kilbride as Ma and Pa Kettle! The movie is based on a memoir by Washington writer Betty MacDonald about her experiences on the Olympic Peninsula near Chimicum from 1927 to 1931. The book was enormously popular and sold a million copies in just a few years. According to Wikipedia, "The film, loosely based on the book, was released in 1947. Main received an Oscar nomination for Best Supporting Actress, and the film inspired eight subsequent Ma and Pa Kettle features." The Friday Afternoon Cinema, hosted by Scarecrow Video through the Silver Cinema Project, is an opportunity to enjoy and then discuss golden age Hollywood classics with movie expert, Rhias Hall. A new classic film is scheduled the first Friday of every month. The Senior Center is in the southernmost building on the Shoreline Center campus. Free parking in the south lot.